Mom and dad stopped by yesterday out of nowhere. They called from the driveway, in classic dad fashion. Well, we had a really nice visit and went out to dinner together at Jim and Nick's BBQ. mmmmm cheddar biscuits.... so yummy. 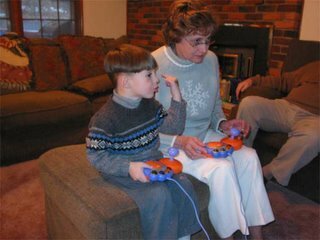 Anyway, so while they were here Conner got out his video games (V-Smile) and he and mom played with it for awhile. It was quite entertaining. So, we had a good visit and yummy dinner and then watched some Home Makeover and Olympics throughout the evening.